Aussie fruit lovers are in for an incredible autumn with the glorious golden glow emanating from orchards across the countryside signalling the return of one of Australia’s best kept secrets – the persimmon. Excellent growing conditions fuelled by lashings of sunshine and ample water supplies, thanks to previous wet seasons, have paved the way for a bountiful crop of quality fruit with high sugar levels, excellent flavour and a strong shelf life. 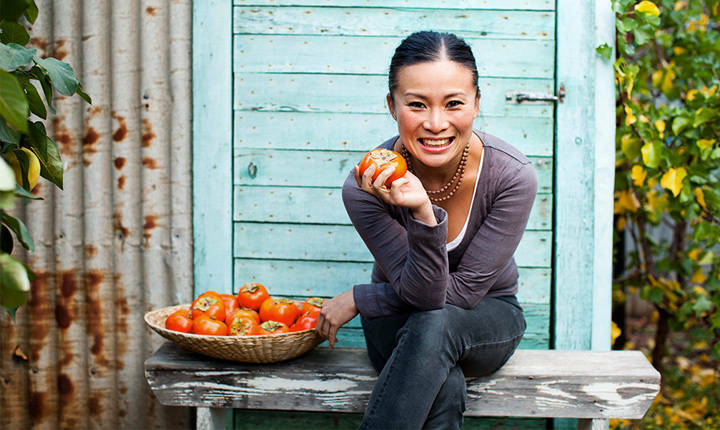 One person impatiently anticipating the harvest of the yellowy-orange orbs is Poh Ling Yeow, persimmon-lover, presenter of ABC’s Poh Lends a Hand, best-selling author and MasterChef all-star. “Despite the fact that persimmons have been grown here for decades, many Aussies are yet to try this exotic fruit, so this season I’m challenging everyone to be adventurous and give them a go. Persimmons truly are the perfect addition to your autumn eating agenda offering an almost indescribable subtle, sweet flavour and fantastic textures to boot,” she said. 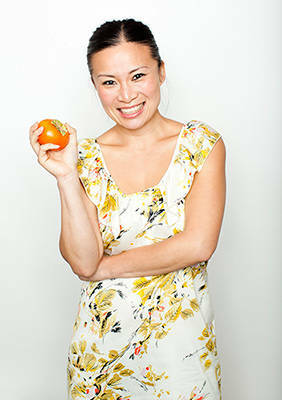 Poh said she grew up eating sweet persimmons, which are best devoured crunchy and firm like an apple, but now also enjoys the original variety, which is ready for eating when the flesh is soft, jelly-like and sweet. “Persimmons also make an amazing addition to salads, adding a delightful crunch and sweetness, and team well with strong cheeses, bitter leaves and nuts. Soft, gooey original persimmons or sweet ones that have gone beyond their firm stage are also great for cooking – just pop them into a cake or muffin mix for an autumnal update to your traditional baked goods,” Poh said. Along with their flavour credentials, persimmons have double the dietary fibre of apples, are high in anti-oxidants and are an excellent source of Vitamin C and beta carotene. Original persimmons have been grown in Australia for almost 150 years, most commonly as a decorative tree in domestic gardens, and are known for their large, heart-shaped silhouette and colour, which ranges from pale orange to deep red-orange. In contrast, the sweet persimmon is round, with a diameter of around 10cm, and has a slightly flattened top. Introduced around 40 years ago, this variety now comprises around 90 per cent of production. Approximately 2500 tonnes of persimmons are harvested Australia annually with the bulk of fruit grown in Queensland. Other key growing areas include coastal New South Wales, the Goulburn and Murray Valleys in Victoria and South Australia as well as some areas of the south west corner in Western Australia. 2017 Australian Persimmon Industry Conference & Field Day – Register Now! © 2019 Persimmons Australia. All Rights Reserved.